Six giants, mentors, masters are the nuclear powerhouse of this extraordinary course. Expert eyes (on soft tissue, gastrointestinal, gynecologic, endocrine, thyroid and liver pathology) and eloquent voices will commemorate stories of lesions you’ll never forget. Recognize the current diagnostic criteria, differential diagnoses, and ancillary studies (molecular, genomic, and stain-based) that clarify and help classify complicated disease processes. The United States and Canadian Academy of Pathology designates this enduring material for a maximum of 18 AMA PRA Category 1 CreditsTM. Physicians should claim only the credit commensurate with the extent of their participation in the activity. The USCAP is approved by the American Board of Pathology (ABPath) to offer Self-Assessment credits (SAMs) for the purpose of meeting the ABPath requirements for Continuing Certification (CC). Registrants must take and pass the post-test in order to claim SAMs credit. Physicians can earn a maximum of 18 SAM credit hours. 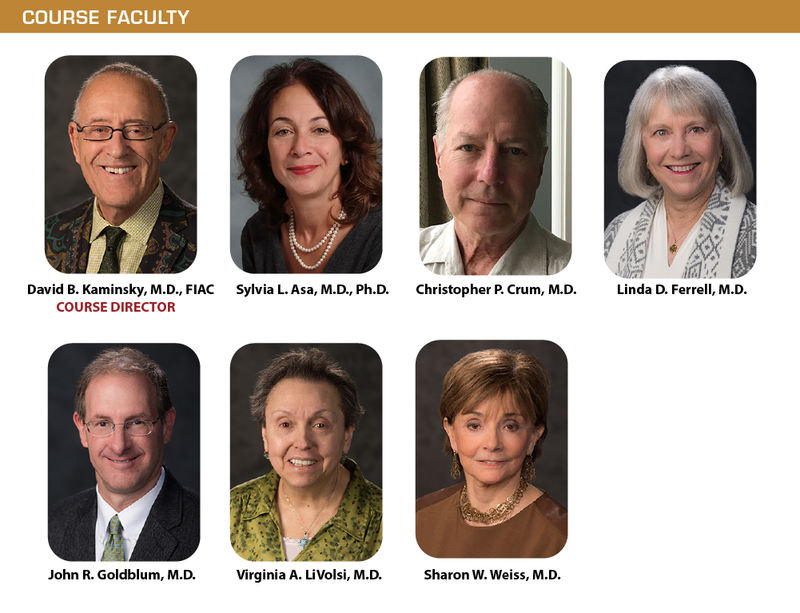 The following faculty reported no relevant financial relationships:  Sylvia L. Asa, M.D., Ph.D., Christopher P. Crum, M.D., Linda D. Ferrell, M.D., John R. Goldblum, M.D., Virginia A. LiVolsi, M.D., Sharon W. Weiss, M.D. Buy the entire Interactive Microscopy: Emeritus Edition and get a great discount!